The black X's are 1 chip bets a total of 11 chips. 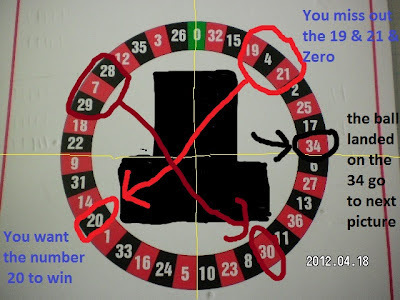 You will win 1 extra chip back, that chip you place straight up on either 0,19,20,21. The 3 numbers that you don't bet on are the only numbers that can make you lose. 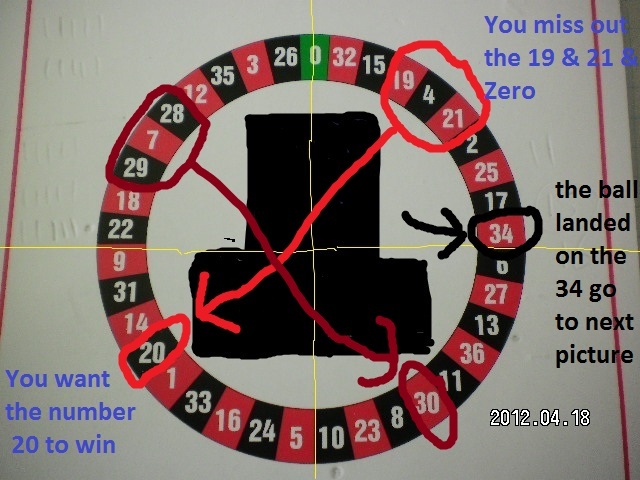 As you can see on the wheel the 19 & 21 are very close to each other. The 28 & 29 are very close to each other. 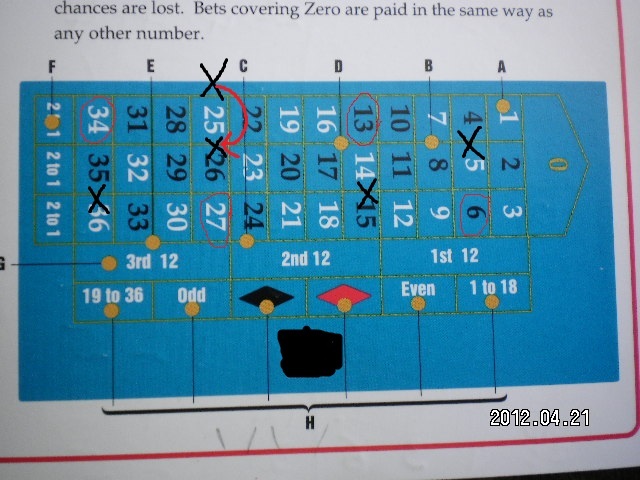 So if the ball last landed on or near 1 or these 2 groups of numbers and we expect the ball to go away from the last place it landed, then that street would be a good street to miss out when you bet this way. You can keep changing the street you miss out each new spin or just use this way of betting when it lands on or near the 2 groups of numbers. So if the ball landed on the number 19 and we expect the ball to go away from this area then you would miss out this street on the table bet and bet 1 chip straight up on either the Zero or the number 20. 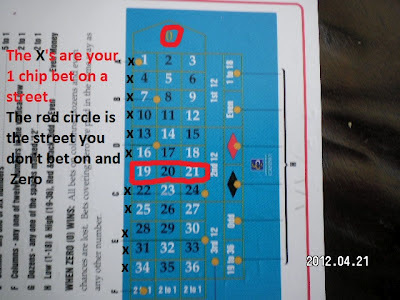 If you are just going to follow 1 number then when eva you have a loss, don't put your chip straight up on the number you are following for a couple of spins this way you will win back 1 chip each time and this will get rid of some of your 12 chip loss. then the numbers close to 34 we will miss them out on the table bet and split the other 2 numbers in that street. this is how you do it on the table bet. 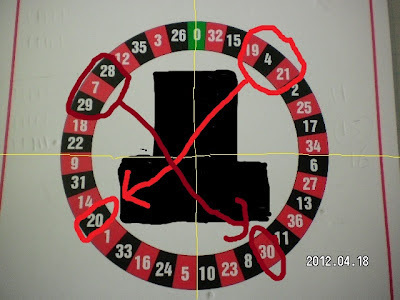 Where the red circles are around a number these are the numbers 13,27,6,34 we have missed them out and taken the x from the street bet and made it a split of the other 2 numbers left in that street so you miss out the number 6 and split the 4 & 5 with the 1 chip that would have covered all of them, and you miss the 13 and split the 14 & 15 you miss the 34 and split the 35 & 36 you miss out the 27 and split the 25 & 26 . 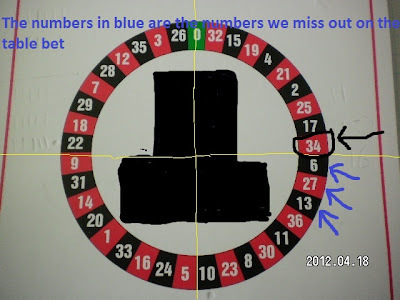 You only do it 1 time and now where eva the ball lands you find different numbers to split. 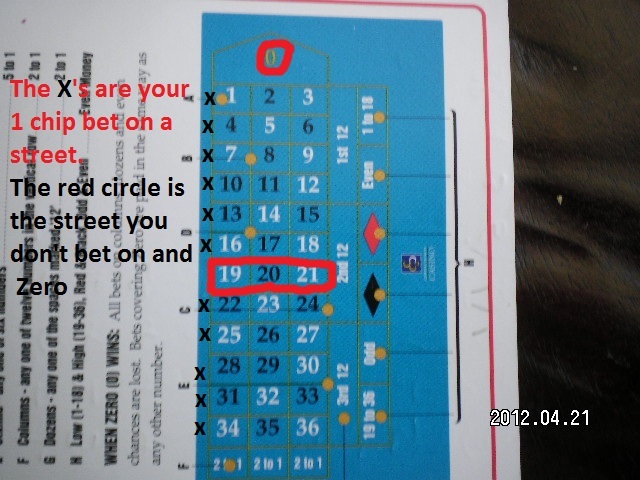 this now would mean that if the 13,27,6,34 came up you would lose 12 chips but you now have 8 split numbers working for you and they will make you 6 chips profit. Practice this until you understand what can happen and what you have to watch out for. another thing you will learn is how often the ball will come back to the last section it was just in, but I will leave that for another time. hello We always enjoy her insights.